Original text trascript below, including an englih translation. Er ist ein Künstler der alten Schule. Der sehr alten Schule. Alexander James kreiert seine Werke im Stil flämischer Maler des 17. Jahrhunderts. Für seine Stillleben züchtet er Blumen und Schmetterlinge, brennt Vasen im Pizzaofen und nimmt sich dafür so viel Zeit, wie es eben braucht. Ich treffe James im Londoner Café Royal, wo seine Bilder momentan ausgestellt sind. Er erzählt mir, dasser sich schon bis zu einem Jahr in sein Londoner Studio eingesperrt hat, bis alle Elemente für ein einziges Werk bereitstanden. „Psychotherapeuten nennen das die Flow-Methode, wobei sich Künstler für lange Perioden nur ihrer Arbeit widmen und nichts mehr außerhalb ihrer Kreativität wahrnehmen,“ erzählt James. Der große Unterschied zu den flämischen Malern? Für seine Schmetterlingsreihe „Swarm“ fuhr er nach Südamerika, um dort Schmetterlingskokons zu erwerben. Er wollte sie nicht online kaufen, sondern die Verbindung zu seinen Kunstwerken verstärken. 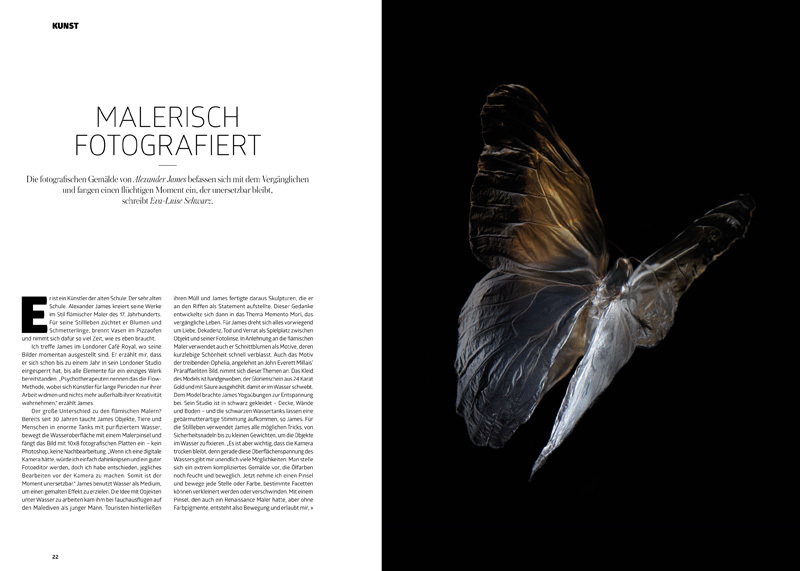 Er erstand nicht nur unterschiedliche Exemplare, sondern auch die Mutterpflanzen, um die Schmetterlinge zu züchten, der Natur also nicht Leben zu entziehen, sondern ihr hunderte zurück zu geben. Für eine andere Reihe entwickelte er einen neuen Prozess, jegliche Pigmente aus Blumenblüten zu entfernen – zum Beispiel Rosenblüten oder Mohnblumen – und diese transparent werden zu lassen. Auf Bewegungen im Wasser reagieren sie besonders sensibel – mit einem bemerkenswerten Ergebnis. The photographic paintings of Alexander James deal with the fugacity and capture a fleeing moment which is unrepeatable. He is an old-school artist. Very old-school. Alexander James creates his work in the style of Flemish artists of the 17th century. For his still-lives he grows flower and breeds butterflies, burns vases in pizza ovens and takes as much time for it as he needs to. I meet James at the Café Royal London, where his work is currently exhibited. He tells me that he previously locked himself in his studio for up to a year until all elements for his work were ready. “Psychotherapists call it the flow-method, where artists focus only on their work for long periods and don’t recognise anything outside their creativity” says James. The big difference to the Flemish painters? For 30 years now, James submerges his objects, animals and humans in enormous tanks with purified water, moves the surface with a paintbrush and captures the pictures with 10x8 photographic plates – no Photoshop, no post-editing. “If I had a digital camera, I would just photograph randomly and be a brilliant photo editor but I decided to edit only in front of the camera. That makes the moment irreplaceable.” James uses water as a medium to create a painted effect. He came up with the idea to work with object under water on diving trips in the Maldives as a young man. Tourists left their rubbish behind and James turned the rubbish into sculptures, which he put on the riffs as a statement. The thought developed into the topic Memento Mori, the passing life. Everything circles around love, decadence, death and betrayal as a playground between object and lens for James. 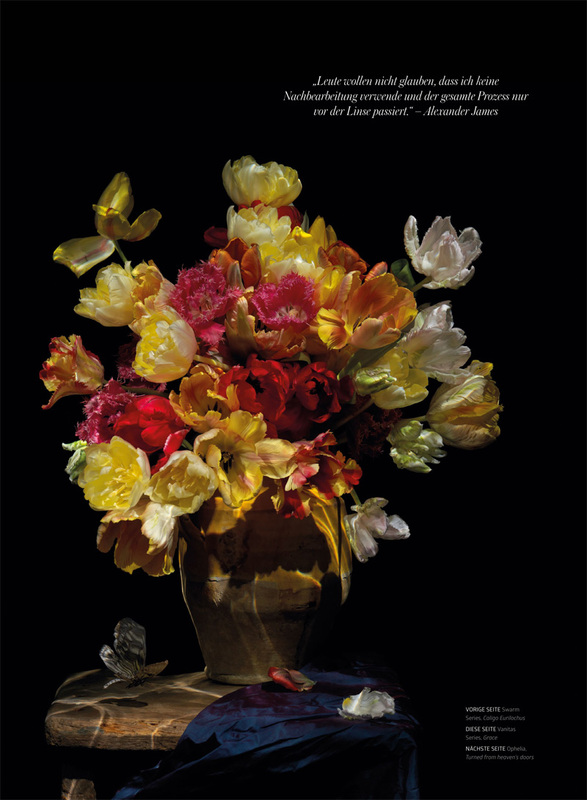 As a reference to the Flemish painters he also uses cut flowers, whose short-lived beauty disappears quickly, as a theme. Also the motive of the floating Ophelia, reference to the Pre-Raphaelite painting by John Everett Millais, embraces this topic. The model’s dress is hand-made; the halo is made of 24 carat gold and hollowed with acid so that it flows in the water. James taught the model how to do yoga to help her relax. His studio is all black – ceiling, walls and floor – and the black water tanks create a womb-like atmosphere, so James. For the still-lives James uses all kind of tricks, from safety pins to little weights, to fix the objects in the water. “It is important that the camera stays dry though as the surface tension of the water gives me endless possibilities: Imagine extremely complicated painting, still wet and movable. Now I take a paintbrush and move every point and colour, certain facets can be minimised or disappear. With a paintbrush, which was also used by Renaissance painters, but without any colour pigments, I can create movements which allow me to capture a unique photographic piece of art”, so James. He adds “It is big fun – I never get bored”. For his butterfly series “Swarm” he went to South America to buy butterfly cocoons. He did not want to purchase them online but strengthen the connecting to his work. Not only did he buy several species but also the mother plants to breed the butterflies. He did not want to take life from nature but give back hundreds. For another series he developed a new process to extract all pigments from flower petals – for example rose petals and poppy petals – so that they became transparent. They had an extremely sensitive reaction to movements under water – with an astonishing result. One of his most famous pieces, Grace, is a still life from the 16th century with flowers from that period. Over seven months James grew French and parrot tulips, made a terracotta vase and burned it in a pizza oven in his studio. Grace was auctioned off at Christie’s for more than 17,000 EUR in October 2013. Water is an extremely important topic for James. He tells me of countries like the USA, where ocean water is desalinated in nuclear power stations. Also in Europe, namely Barcelona, 20% of the water comes from nuclear power stations. This rises to 90% in the summer months, so James. He regrets that the human race has made some fatal decisions when it comes to water and crude oil. These two elements will be combines in his next project: He will move his studio to Siberia, produce sculptures from frozen crude oil and photograph them under water. Crude oil freezes at -30C; with temperatures of -45C in the Siberian winter, he should not have any problems. And this is when we say goodbye and outside on Piccadilly Circus the time goes by a little bit faster again.